Today Mom and Dad celebrate their 63rd wedding anniversary. It’s such a big day that our entire nation decided to honor them by having Thanksgiving on the same day, and not to be out done, Jerry Jones got involved and is hosting a Cowboys football game so that Dad can really have the perfect afternoon! (LOL) Yes, it truly is an anniversary to be thankful for! 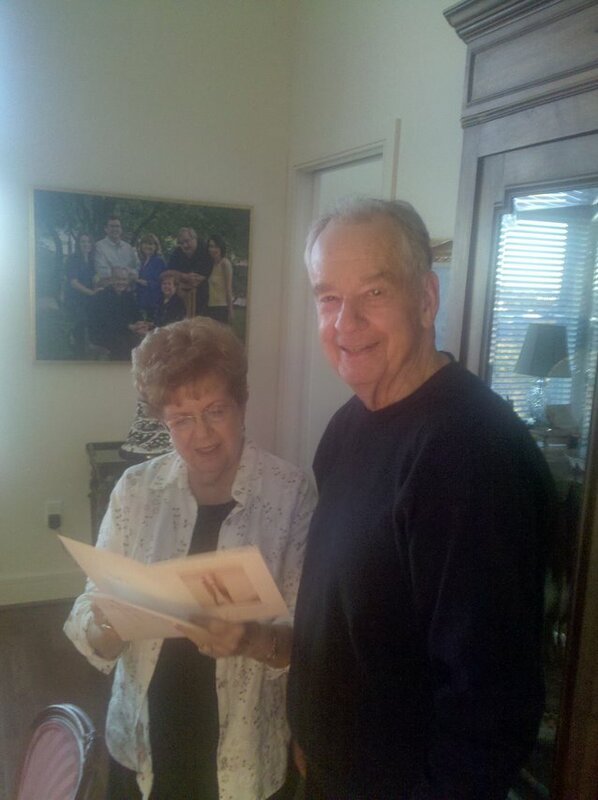 Yesterday I had the privilege of watching Dad sign the anniversary card he gave Mom. 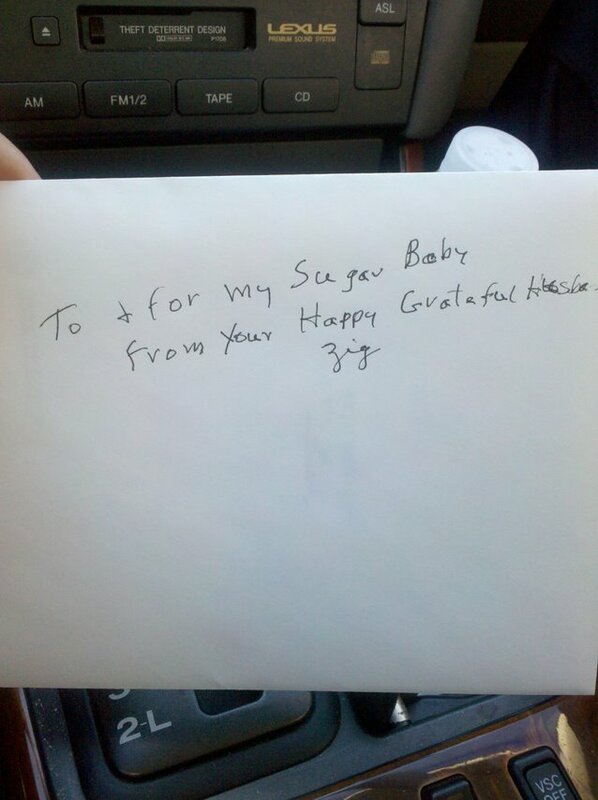 I took a picture of the envelope so you could see his personalized message. Amazing how a few minutes and a few thoughts can turn a blank piece of paper into a treasure. Here is Mom opening and reading the card. What are you thankful for today? Take a few minutes and make a phone call or send a note to a friend or loved one and let them know what they mean to you. Many people are Embracing their Struggles today, and for them a little extra love and encouragement from you might make all of the difference. We have some good friends, Michael and Brenda Pink, who are going through a health struggle right now. Would you remember Brenda in your prayers? Thanks everyone from making this blog one of the most fulfilling things I do! If you want to leave Mom and Dad a happy anniversary greeting, just comment below and I will make sure they get it. Yesterday I watched as Dad spent nearly 10 minutes writing Mom a special note on the anniversary card he gave her. After 62 years he still wanted it to be “just right.” When I saw Mom’s eyes light up when she got the card, I knew once again that spending a few extra minutes making things “just right” is worth every minute. Mom then wanted to display the card and as you may know they are selling their house. The book shelves in the family room are cleaned out getting ready for the move, but now standing proudly all alone on those shelves for everyone to see (even the prospective home buyers who are coming through the house) is the card from Dad. Why don’t you spend a few extra minutes this Thanksgiving making things “just right” with those you love? In my quest for eating pure I decided to stop using all artificial sweeteners. Since I love iced tea, especially with spicy food, this was a big deal for me. A typical lunch or dinner would consist of five or six glasses of tea, each one getting about three of those little pink packets of the artificial stuff. When I made this change, it wasn’t because of all the scientific studies on the possible harm that artificial sweeteners could cause; it was simply because eating pure food, the way God made it, and then adding a chemical to it just didn’t make sense to me. One thing I discovered pretty quickly is that when you eliminate artificial sweeteners you also eliminate a ton of their chemical buddies as well – just check out the label on a diet soft drink and you will know exactly what I mean! At first this was a pretty tough change for me. Tea just didn’t taste the same. After the first week my tea was just barely tolerable. After the second week tea tasted “ok.” After the third week I was looking forward to tea again, and by the end of the fourth week I realized I would never go back. In fact, several times over the last year I have accidentally taken a sip of artificially sweetened tea and now I can’t stand it! It’s like my mind is screaming “Intruder Alert! Intruder Alert!” when the artificial stuff hits my tongue. I went cold turkey off the artificial sweeteners in July and by September it became my normal life. I didn’t really think much of it until Thanksgiving when we had a pot luck lunch at the office. My sister (thank you, Cindy) brought in baked sweet potatoes. I had never really liked sweet potatoes, so it had been several years since I had even tried one. For some reason I decided to try one. I had it dry – no butter, no sugar, nothing but a pure baked sweet potato. I have to tell you I thought I was in heaven when that first bite went into my mouth! It was so sweet I couldn’t believe it. It felt like I was eating ice cream or cake or pie! That is when I realized that because I had cut out the artificial sweeteners my taste buds had come to life! All of a sudden it made perfect sense why fruit was tasting so much better and was so much more satisfying. All through my dieting life I had heard the word “satisfying” to describe what a good meal should be. Until that point I don’t think I ever really understood what satisfied really felt like. For years I thought picking an artificial sweetener was saving me calories and satisfying my cravings. Instead, they were just filling my body with junk, ruining my taste buds, and increasing my cravings for more junk! This reminds me of a great biblical illustration. I have heard it said that every person has a need for God that only God can fill. We don’t like that (because admitting it means we can’t fix our own problems), so we go through life filling that need with the artificial sweeteners of life – our work, more money, more stuff, alcohol and drugs, selfish relationships centered around lust, just to name a few. We crave more and more, we indulge more and more, and we are never satisfied. Artificial is artificial – and NEVER satisfying.